Princess Kimri is used to betrayal. Her brother sold her to a king in exchange for swords to defend his lands. King Tathan's reputation is as fierce as that of his mountain kingdom—where dragons are said to guard the castle walls—but the realms are unstable enough without angering the mountain-king, so Kimri reluctantly agrees to the union. Karalynn Lee has swept me away with her fantastical romance, Heart of the Dragon’s Realm. Even though this is my first time reading anything by Lee, the cover jumped out at me, giving a reason to explore further. The image of a young woman leaning on a sword in seemingly deep concentration, while creatures fly around in the background, had me all but trying to crawl through my computer screen to request a copy for review. Kimri’s story is even more enticing as it begins. Two kingdoms are at war: Anagard, ruled by Kimri’s brother Dereth, and Kenasgate, ruled by a hard, selfish king. On the sidelines of this war is the legendary kingdom of Helsmont, said to be protected by a mountain dragon, to which King Dereth forms an alliance in exchange for Kimri’s marriage to its king, Tanath. Kimri goes along with this situation even though it’s not ideal. She voices her opinions, but I admire Kimri for not trying to escape and instead making the best of her ordeal. Her stay with the mountain-king in Helsmont brings out a side of her that she’d had to repress in Anagard. Women are able to pursue whatever path they desire in Helsmont, including becoming a guard or messenger, which primarily endears the kingdom to Kimri. She comes alive in the mystical city filled with generous people and surrounded by undisturbed nature. Kimri’s relationship with Tanath is uncomplicated for a time; they draw close as she discovers him and the land he’s so dedicated to. I’d love to see more characters similar to Kimri from Lee; strong, resilient, and full of surprises. Heart of the Dragon’s Realm’s plot has just enough forward action and it doesn’t feel as though the story ever comes to a standstill. The well-developed characters introduced, no matter how big or small their role, come with a shroud of mystery, off-putting hostility, or a faultless loyalty to make for a varied and entertaining cast. Kimri’s tale has a natural progression where every good or bad event in the story fits and the overall effect is a seamless story that you’ll want more of. This is a brilliant novel that readers who love romance and fantasy can appreciate. 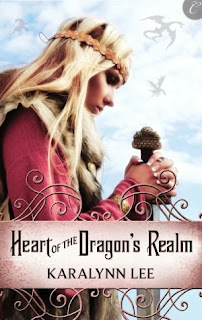 Karalynn Lee successfully blends both genres to create Heart of the Dragon’s Realm while fully satisfying readers.